A great gift for the wine lover and perfect for event giveaways. These wine pourer discs are washable and can be reused. Easy to use, just curl into any bottle top and create the perfect no drip pour. There are many presentation options available. 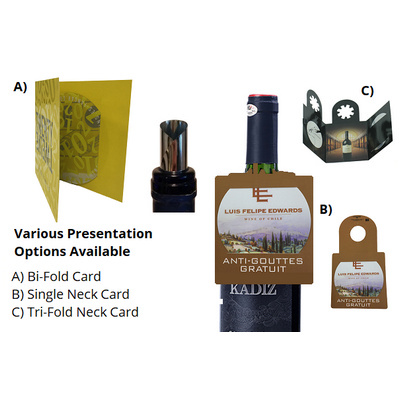 Price below includes full colour branding on the wine pourer disc with a single card presentation. See option to upgrade to a tri-fold / 3 part card. Note you can also get a single card with a neck hanger option - ask for a quote for this option. Price includes: Full Colour 1 Side. Setup is included.